Renowned as the largest city of Bihar, Muzaffarpur is renowned for ancient temples and litchi farms. This region witnesses harsh weather conditions, however, this place can be best visited in the months from December to March. December to February- It is the time when the temperature drops down to single digit and the average temperature during these months is 6°C. The days are a bit warm during this season, thus making it possible for you to explore this place properly. March to May- Temperature in this season varies from 28°C to 40°C. The hottest month here is May, and carrying light cotton clothes is highly recommended to stay comfortable in this season. July to September- Under the influence of South West monsoon, the place receives medium rainfall. However, heavy rainfall is also experienced in this season and the temperature drops down by a few degrees, thus bringing some relief from the scorching heat of summers. Pleasant For all those who wish to indulge in the beauty of mighty Himalayas, a trip to Muzaffarpur during January would be a delightful treat. Set amidst beautiful landscapes and various monuments, Muzaffarpur beckons tourists travelling from all over the country. Cool wind blows throughout the day therefore it is important to pack some warm woolen cloths when heading towards this city. Pleasant Pleasantly comfortable climatic conditions welcome tourists travelling to the city in February. Vacationers can easily plan outdoor activities, along with sightseeing trips as cool breeze helps to keep the day’s temperature between 19°C - 21°C. Adventure enthusiasts can also take part in different activities, such as trekking or hiking the steep slopes present in the region to make their holidays a memorable affair. Moderately hot Onset of summers is marked with the beginning of the month of March. The temperature begins to soar making it difficult for the travelers to enjoy their trip to the fullest. Travelling during the day should be avoided, as the afternoon sun can play havoc with the health of the tourists. While venturing out, remember to protect yourself from the summer sun. Very hot Clear skies dominated by ample sunshine make it difficult for the tourists to venture out. Warm winds blow throughout the days, further increasing the temperature. This is not a suitable month for tourism; however budget travelers can still plan their holidays. Being off season, vacationers can avail different discounts on accommodation and tour packages. So before planning your trip, remember to check the climatic conditions of the city. Very hot With the temperature reaching as high as 38°C-40°C, month of May is regarded as the hottest month of the year. Days and nights are equally hot; therefore staying indoors should be preferred over outdoor activities. Extra care of small children should be taken as afternoon sun can be harsh on them. While travelling to the city during summer, carrying sun protective gears and umbrella is important. Very hot June offers some relief from the scorching heat; however the climate is still not suitable to indulge in sightseeing or travelling to different attractions of the city. Warm winds that blow throughout the day can make it difficult for tourists to enjoy their holidays to the maximum. However, evenings are comparatively cooler and thus vacationers can explore the region during that time. 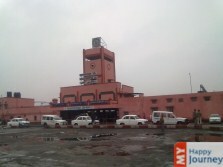 Rainy Muzaffarpur experiences extreme of every weather and thus the region receives heavy rainfall with the beginning of monsoons. Rains help the region to look more beautiful amidst picturesque landscapes. Tourists who have interest in photography can click some amazing pictures of the city, which is surrounded by various scenic locations. So pack your rain gears and do not forget to keep the camera as well. Rainy Gratifying monsoon showers continue to hit the city; thus this is not a suitable month for tourism. However rain lovers and nature enthusiasts can plan their trip during this time as the region looks heavenly amidst monsoon showers. Day trips can be made interesting by exploring different attractions which the city has to offer, along with enjoying the scenic locations of the region. Rainy Most of the days of the month are rainy; however some days can go without rainfall or thunderstorms. Due to the monsoon showers, temperature remains within comfortable ranges however outdoor activities are hindered with the presence of rain. Tourists can plan indoor activities and enjoy with their family and friends. Do not forget to pack your rain gears to enjoy your holidays to the maximum. Moderately hot As the skies get clear and sun shines through, post monsoon season brings along excessive humidity. Temperate weather conditions allure vacationers, who wish to spend some quality time with their loved ones. The natural charm of the city is increased after the monsoon season and it is worth exploring. October is one of the best months to experience fascinating beauty of the region. Pleasant Enclosed by scenic views and pleasant ambiance, Muzaffarpur is a suitable place for tourism during November. This month offers good weather to engage in adventurous outdoor activities and travelling to nearby attractions can also be enjoyed during this time. So take up a suitable holiday package according to your requirements and plan your trip to Muzaffarpur in the best possible manner. Cold Advent of winter season is marked with the beginning of the month of December and the region experiences extreme winters. The temperature can sometimes drop down to single digit making the city extremely cold. Days can be sunny; however after sunset Muzaffarpur witnesses biting cold nights. This month offers good time to explore different attractions that the city has to offer.